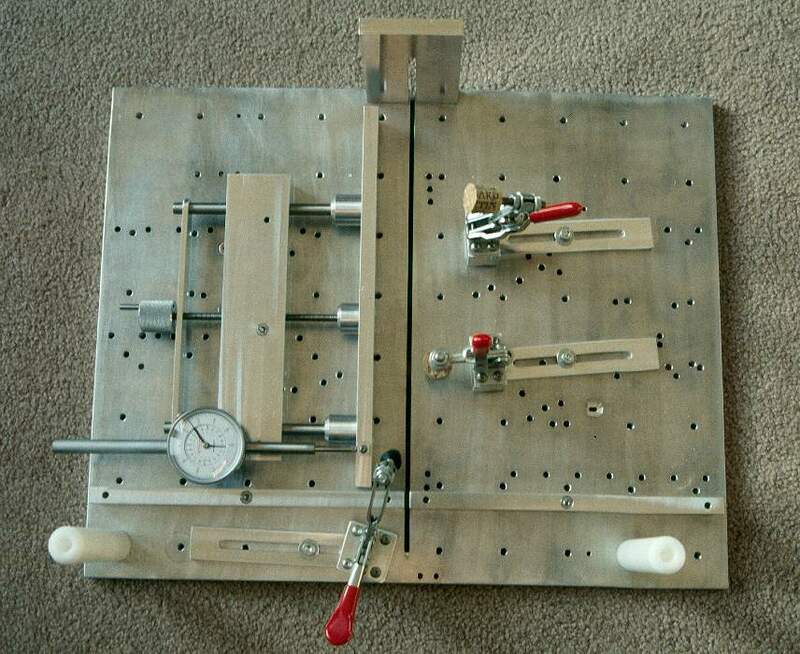 This is a puzzle making jig I made for my tablesaw. 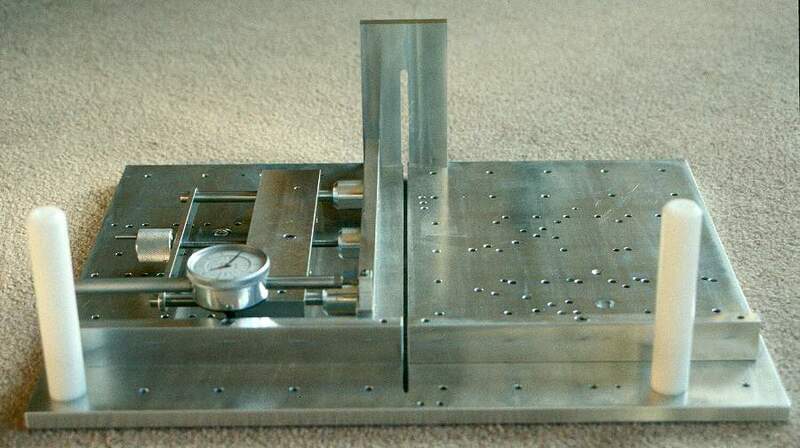 It is a precision sliding table designed to make small parts accurately and repeatably. The intent is to allow me to make tight fitting wooden puzzles. The table itself is built from a half inch thick aluminum plate. The plate has a slot cut most of the way through the middle for the tablesaw's blade. There is a front support to keep the plate from flexing. 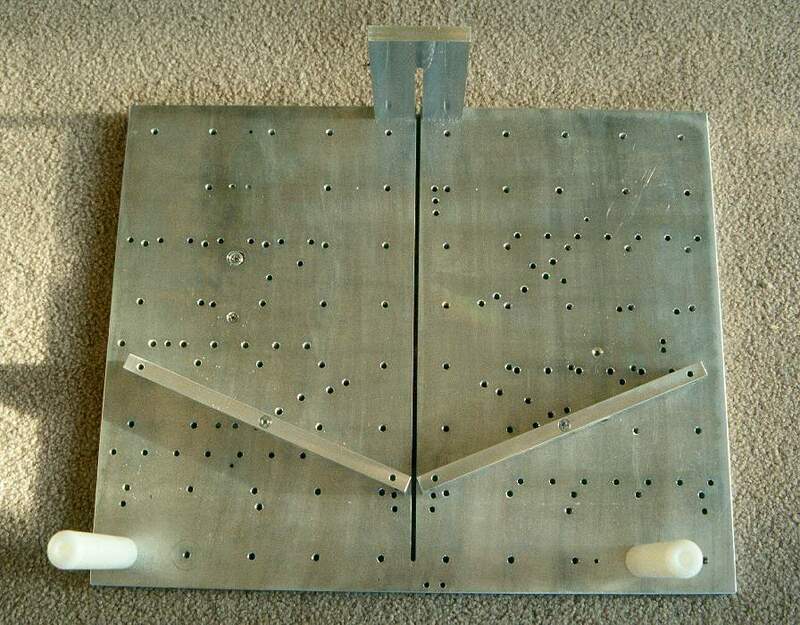 The plate has a set of ball bearings that run in the saw's miter slot. 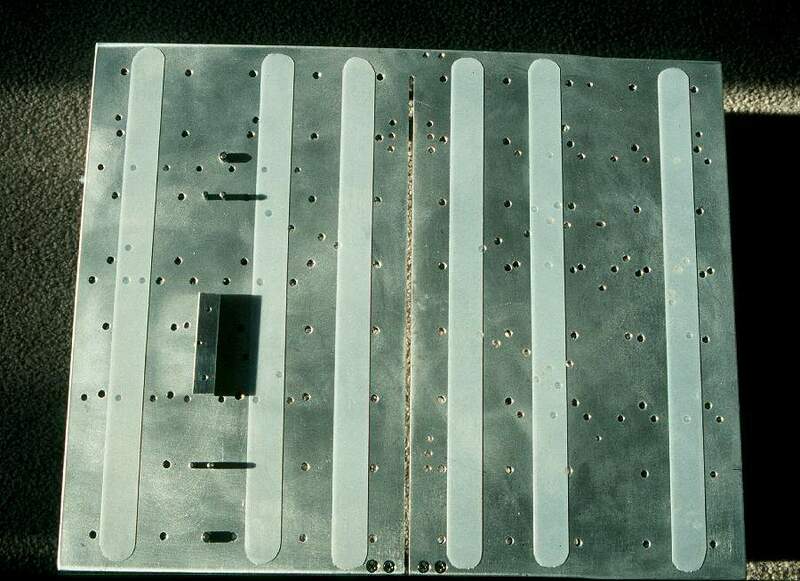 An array of ¼-20 holes on 2" grid allows arbitrary placement of toggle clamps or other accessories. The clamps can hold small pieces of wood securely so that the operator can keep his hands safely away from the saw blade. 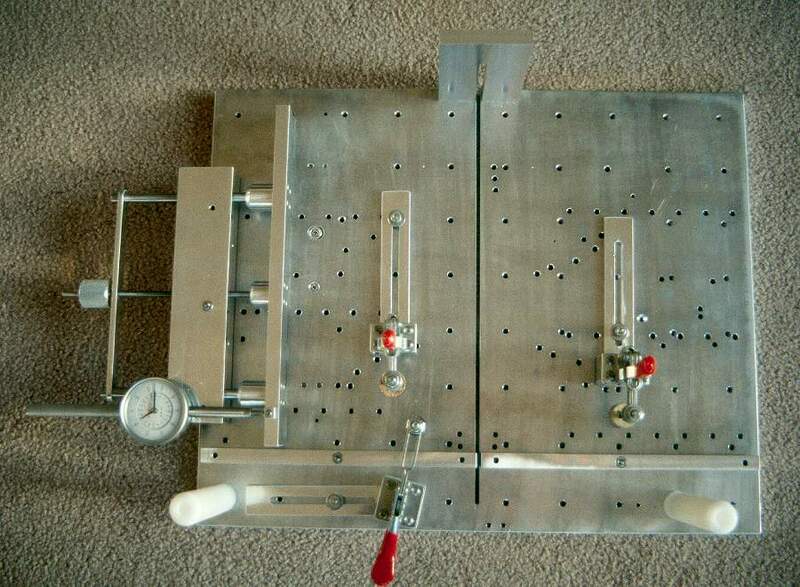 An adjustable rip fence can be mounted and used for precision rips of small stock or for defining the width of a cross cut. There are two rear fences that can be placed perpendicular to the saw blade for use with the adjustable rip fence or when using the jig as a plain miter sled. The rear fences can be moved to 22½°, 30°, 45°, 60°, or 67½° from perpendicular for cutting precision miter angles. The adjustable fence rides on two precision ground stainless steel rods and is controlled by a stainless steel lead screw. A dial indicator gives an easy way to read the actual location of the fence. The fence is adjustable over a 2" span, but the whole mechanism can be placed in one of seven locations on the base plate spaced 1" apart. This gives a total range of 8". 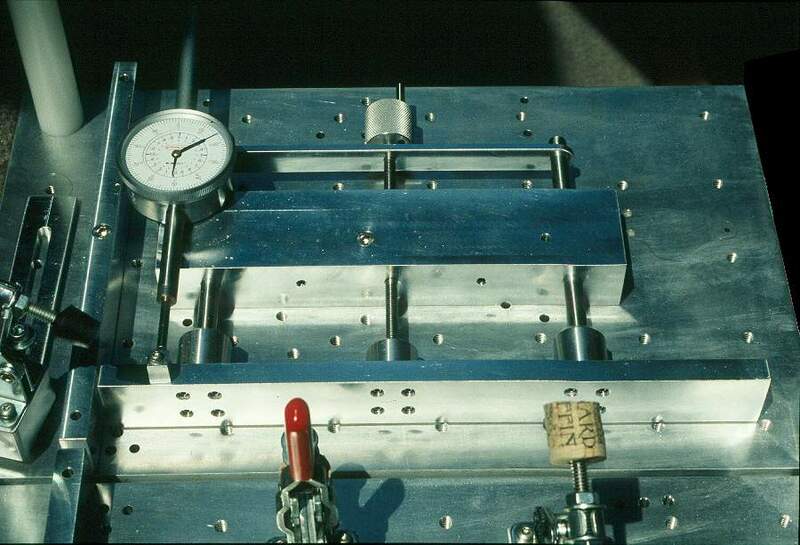 Registration is provided by a pair of tooling pins visible in the right hand image. This shows the adjustable fence moved to its far left position on the table. 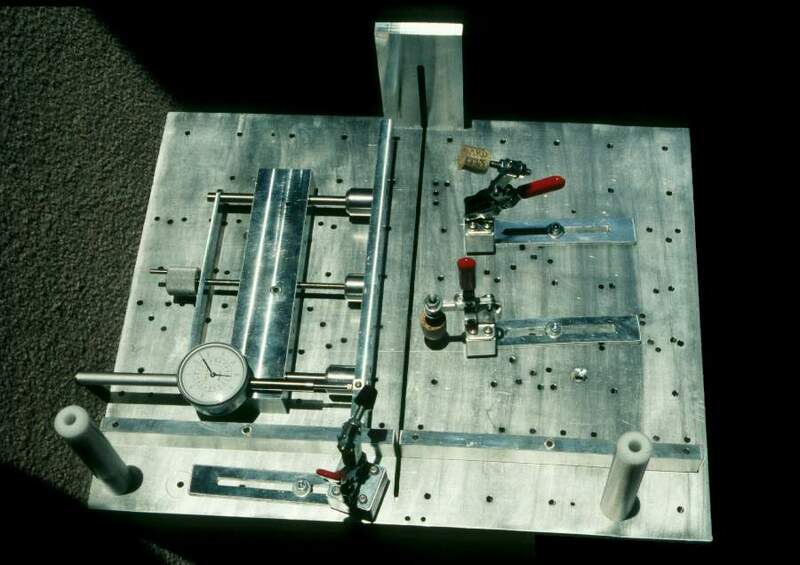 The bottom of the aluminum plate has HDPE (High Densit PolyEthlene) strips to reduce friction and let the table slide easier. Three ball bearings control the motion of the table. 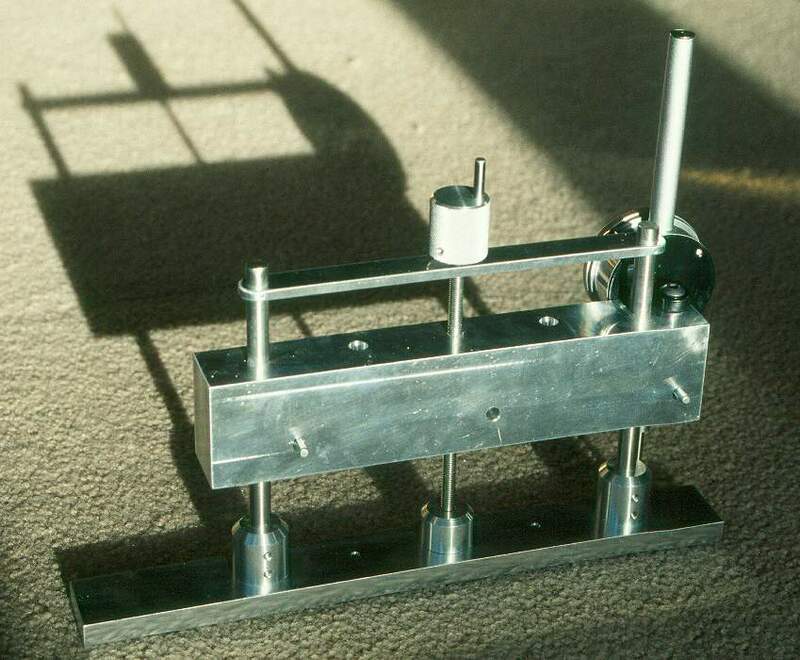 Two of them are fixed and determine the accuracy of the cut angles. They register the location of the plate to the right edge of the left miter slot on the saw. The third ball bearing is adjustable over a small range to allow for slightly different sized miter slot widths. These bearings provide a three point reference to determine the location of the plate. I also put some pins in the bottom near the bearings. In normal use these don't do anything - they shouldn't touch the miter slot walls. 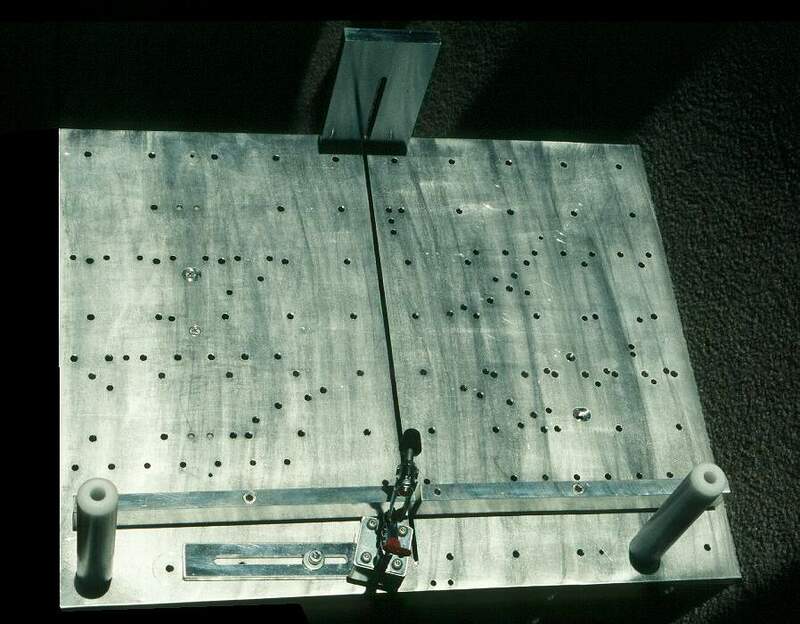 However, when the table is placed on some surface, they protect the ball bearings from impacts. The adjustable fence can be removed to allow the sled to be used as a traditional miter sled. The rear fences can be left perpendicular to the blade or set at angles of 22½°, 30°, 45°, 60°, or 67½° and fastened with ¼-20 bolts. 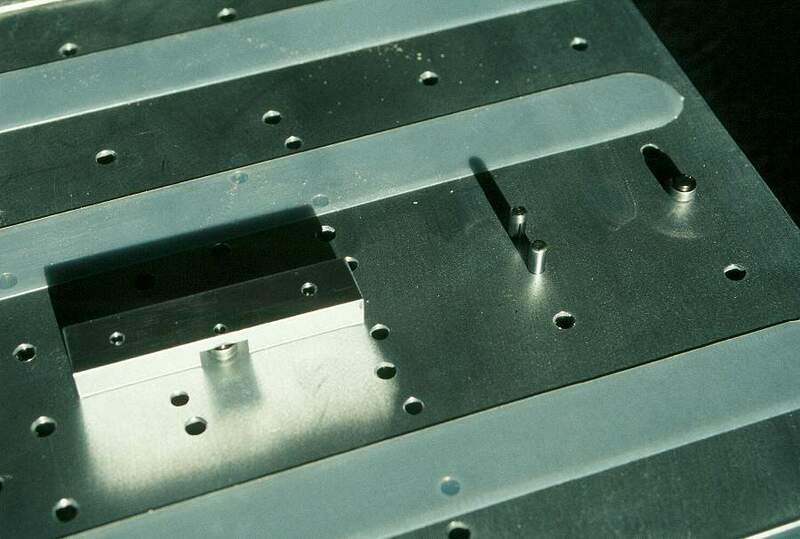 Registration of the fence is provided by a pair of tooling pins located at each end of each rear fence piece. This shows a more level view of the table. The front support piece and the two rear handles for the operator's hands are clearly visible. I'd like to thank my machinist friend Lynn King for the untold help and advice he gave me during the course of this project. Without him, I wouldn't have been able to build this.